Learning how to play blackjack using a basic strategy card is relatively easy given the willingness to do so. Basic strategy is the optimal set of rules to follow for playing blackjack. Using simple basic strategy you will cut the house advantage for blackjack to about 0.50%. A simple blackjack strategy card is often used for memorization and as a reference at the tables when allowed by the casino. The table below each set of rules is the relevant section of the blackjack strategy card. You read these tables by looking at the column for the dealer upcard and the row for your hand total. A soft hand includes an ace valued as “11” such as a hand consisting of Ace+6, or Ace+2+4, but not Ace+Six+Ten. Another way to think of a soft hand, is that it is a hand that you can’t bust by taking a hit. 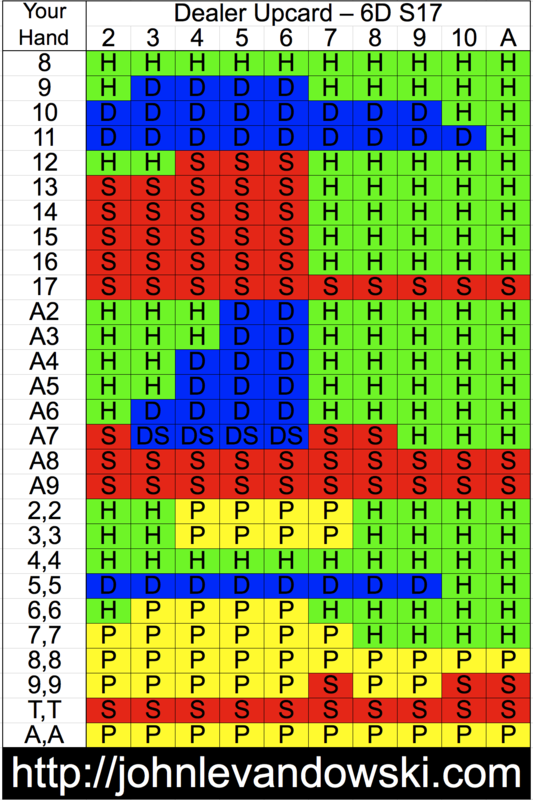 For simplification, the table above only lists A6, A7, A8, and A9. However the 6, 7, 8, and 9 represent any cards that total to these values. For example A6 represents A6, AA5, A24, A33, etc. The blackjack basic strategy card below combines all the blackjack basic strategy rules you have learned. Here is a link to the best printed set of blackjack basic strategy cards available to buy. They are great for those times when you need a quick reminder of the best strategy for a given hand while you are at the blackjack table.